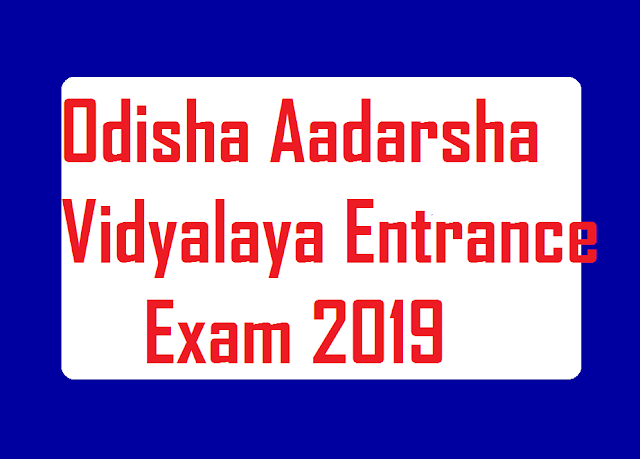 For applying for OAVS Entrance Exam 2019 or Adarsha Vidyalaya Entrance Exam 2019 a notification is released regarding admission into Odisha Adarsha Vidyalaya. Students who are seeking to take admission in Odisha Adarsha Vidyalaya they must check notification of OAVS. This is a nice step of the Odisha Government to give the best education. 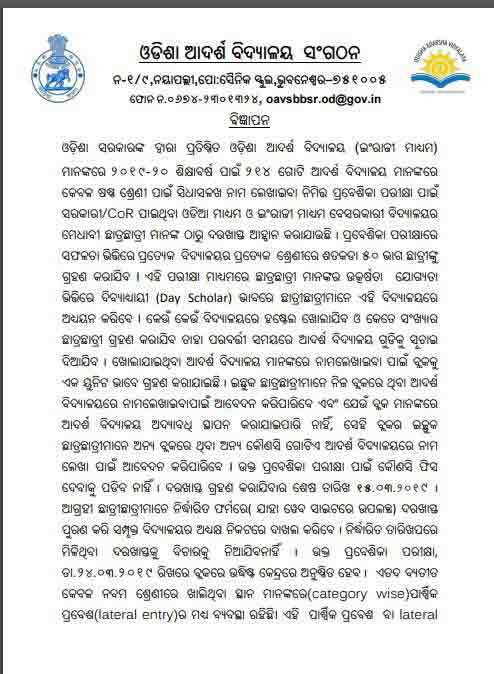 Now every year a large number of students are applied for Odisha Aadarsha Vidyalaya Entrance Exam 2019. Those students who are selected in the entrance exam they can take admission into Adarsha Vidyalaya. How to get OAVS Entrance Exam Notification 2019? A notification for the OAVS Entrance Exam 2019 is released at official website www.oavs.in. Those students who want to take admission have to apply entrance exam of Odisha Adarsha Vidyalaya To get notification file please visit the official website or also get through the below-provided link. When the OAVS Entrance Exam will be held? The OAVS Entrance Examination 2019 will be held on Dtd. 24.03.2019 at selected centers of your Block. It is important for you that the last date of applying for OAVS Admission 2019 for class VI is Dtd. 15.03.2019. No application will be received by the OAVS Authority after the due date. How to download the OAVS Entrance Exam Application Form 2019? To download OAVS Entrance Exam 2019 Application Form or OAVS Admission Form 2019 you have to visit the official website of OAVS. After download, this from you should fill it correctly and submit it along with relevant documents. By following some below-mentioned steps you can download OAVS Entrance Exam Application Form 2019. You visit the official website of OAVS which link is below in this post. Next, find on homepage " Admission" tab. Click on the admission button. Next page, you can see the "OAVS Admission Form". Here your application form will be downloaded into your device. Save this form and take a print out for apply. Which Documents are Required to apply for OAVS Entrance Exam 2019? You should keep ready below mentioned documents before applying for the OAVS entrance exam. When the OAVS Entrance Exam 2019 Merit list will be declared? After the successful completion of OAVS exam, checking your answer sheet OAVS will be declared the Merit list of all students. Please keep regular visit for updates of OAVS Entrance Exam. students can check their OAVS entrance result by name, registration number, date of birth or roll number. To check your result you have to visit the official web page. Until result will declare please keep patient and visit this page regularly for latest updates. Finally, I hope that you have no question about OAVS Entrance Exam 2019 Notification, Application Form, Result. If you have any problem to check result please leave a comment in comment box below in this post. Please share this post to your friends and relatives.